Google is pouring personalized social data into search results with its new Google Social Search, launching in experimental mode today. Google Social Search, announced at last week's Web 2.0 Summit, adds content from your friends right into your Google searches. Unlike Microsoft's Bing-based Twitter search, Google's Social Search uses your own lists of contacts from various services to build up a network, then features content specifically from the people whom you know. And, while it does include Twitter, it also includes FriendFeed, shared Google Reader stories, and other social content from around the Web. Google Social Search is currently considered part of Google Labs, so it's not enabled by default. To try it out, just visit Google's Experimental Labs page and click the button to "join the experiment." Once you've joined, you'll immediately start seeing social information at the bottom of your search result pages. You can also click on the "Show Options" text at the top left of the page -- or click on the "Results from people in your social circle" link at the bottom of the page -- to filter the results and see only the social information. To test the Social Search system, I tried searching for the term "Apple." 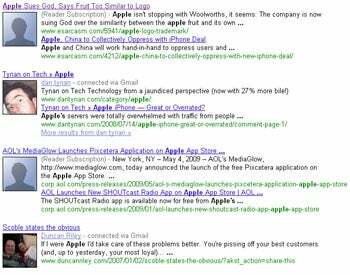 Google's first social result was a satirical story -- "Apple Sues God, Says Fruit Too Similar to Logo" -- pulled from my Google Reader RSS subscriptions. Below that were links to blogs a couple of my colleagues had posted regarding Apple; Google cross-referenced them from e-mail addresses in my Gmail contacts list and uncovered their stories. There was even an Apple-related tweet sent by one of my Twitter friends -- PC World's Robert Strohmeyer -- grouped together with an Apple tip he had posted on his personal site and an option to see more of his related content. So where's Google getting all this information? The answer, not surprisingly, is through Google. The main venue for culling your social content is your Google Profile. It's an easy-to-create page about yourself that allows you to add links to your various online profiles: your Twitter stream, personal blog, FriendFeed page, you name it. You have to decide to create a Google Profile and manually add these details in for Google to be able to build your "social graph." Doing so, explains Google engineer Matt Cutts, also authorizes Google to associate that info with your name within other users' social searches. "Once you've created a Google Profile and added links to your various online social services, you've signaled a very clear choice that you're comfortable with the world knowing that information, including that you're a part of the other social networks you listed," Cutts explains. "Based on this opt-in decision, Google can start building a broader social graph." In addition to your Google Profile connections, Google Social Search uses data shared by your Google Chat buddies and within your Google Reader account to build its results. It'll also branch out further, pulling publicly shared social data from friends of friends -- say, someone whom your Twitter buddy is following but you aren't -- then including that data within your Social Search results. All of the indexed content is publicly shared, and you always have the option of removing any services from your own Google Profile. 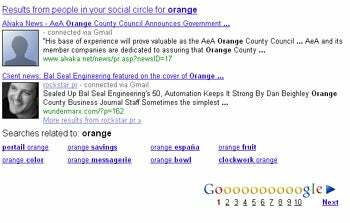 Want more info on Google Social Search? Below are a couple of videos that might be helpful. You can also check out the official Google Social Search features page, now live on the Google support site. Google's Maureen Heymans discusses some of the ways you can control your information and understand all of your social connections. Google's Matt Cutts goes into greater detail about the mechanics of Google Social Search and how it operates. When not searching his social circle, JR Raphael writes geek humor at eSarcasm. You can keep up with him on Twitter: @jr_raphael.